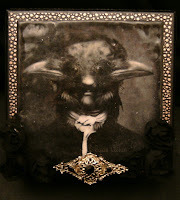 Welcome to a Goth day..... i have 2 new challenges to tell you about and both pieces i made are very GOTHIC . First up our new challenge at SMUDGY ANTICS....... WHEELIE GOOD TIME......remember no cute.... we dont do cute.....make something.....anything.....as long as somewhere its stamped...either real rubber or digi with WHEELS ON..... easy hey? I used one of the DEATH CAB images from SMEARED INK....and printed it onto an image from the internet.... thats as digi-clever as i get! I then stamped around the edges with a boarder stamp and used lots of black ink. I used a MS punch and a T!m holtz die....some ribbon roses, a piece of ribbon, knotted to hold an ornate cross from my stash..... i then set to work with a white gel pen to do all the high-lights on my well inked image. I matted and layered it onto silver then black card. The small close up on the right shows the detail better. You have 6days to join in....we really look forward to seeing what you create. that uses or includes a Goth theme. Think black, lace, leather, elegance, etc. Yeah, I know... an easy challenge..... but a good one! I have altered a box, using leather textured paper. I printed out the image that we are using as our logo on QUOTH THE RAVEN....(see blog post below...... WONDERFUL CANDY ON OFFER THERE IF YOU BECOME A FOLLOWER!.....sorry i just had to get that little plug in!) 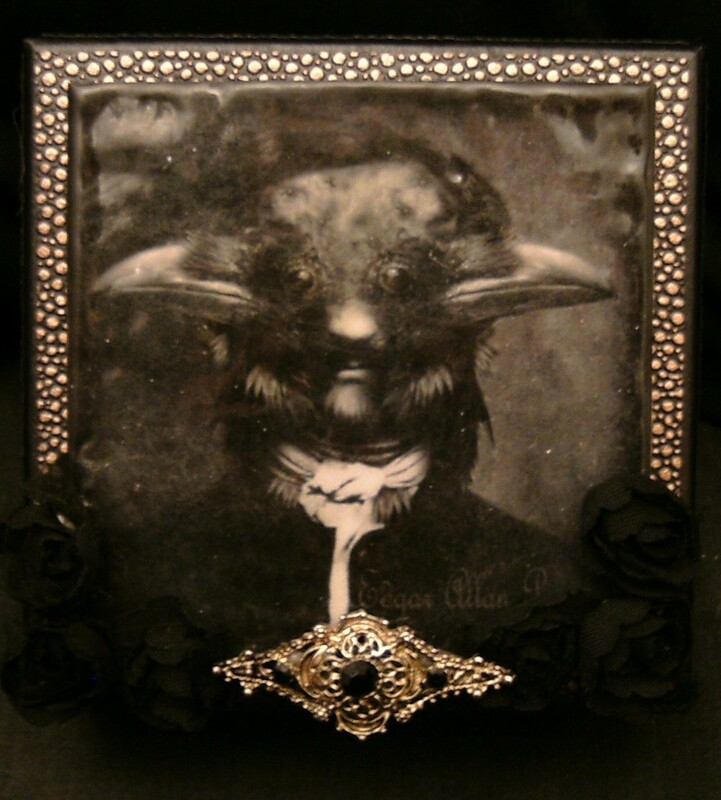 triple embossed it to make a tile..... added ribbon roses and a pretty Gothic looking piece of broken jewelry. The ...what to put in the box? What is more Goth than a satin and lace cuff? 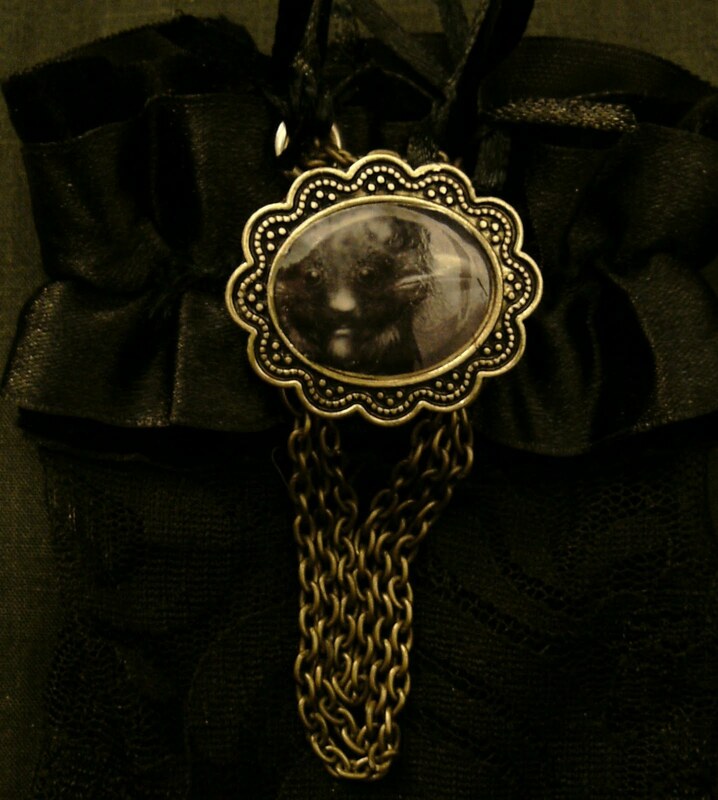 I added ribbon, and chains....and made a brooch using the same image..... it can be removed and worn on your jacket.... or where ever you fancy! Please come and show us your interpretation of GOTH...we love seeing what you guys come up with. 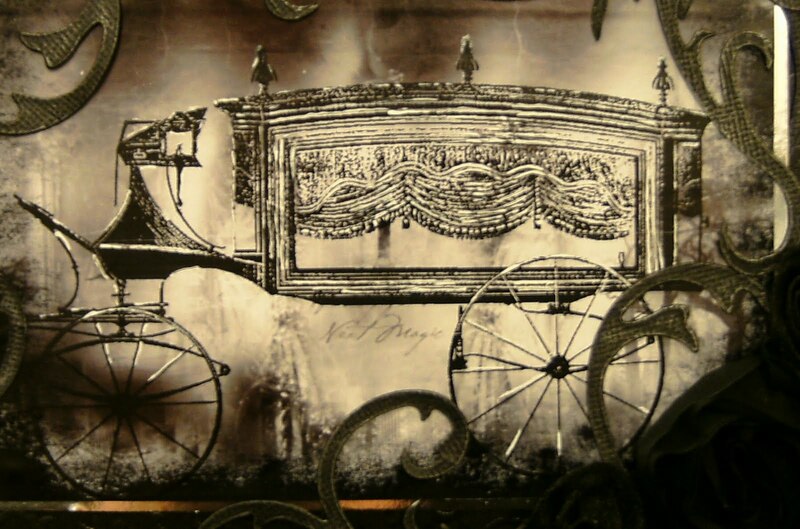 http://onestitchatatimechallenge.blogspot.com/ USE A DIGI.... the hearse in the 1st project is a digi image from SMEARED INK. http://opus-gluei.blogspot.com/ OUT WITH OLD, IN WITH THE NEW. my 2nd project is celebrating the NEW POE BLOG.... using old an old box and a broken jewelry. http://www.papercreationsink.com/ DIE CUTS AND PUNCHES.... my top project has both! Thxs for joining us over at Robyn Fetish challenge. 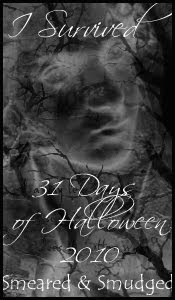 I love your Smudgy Antics challenge piece- it looks exactly like vintage photo. Actually all of your pieces today have an authentic vintage look. That image for your Poe challenges is flippin' insane!! Did one of you make it? It is wonderfully unnerving! Absolutely Gorgeous. Again. You are the most amazing person to be able to create so many beautiful pieces time and time again.!!! What a lovely array of projects! Wow, very cool projects - and definitely not cute! Thanks for playing along with Pile It On this week! These are very interesting projects. Paper crafts appeal to everyone in its on way. Love it. Thanks for joining us at Robyn's Fetish this week. Good luck and hope to see you back next week. Your stuff is always so great. I love when I come to see you and your dark arts! Thank you for playing with us at the Opus Gluei! Always a pleasure to see you! 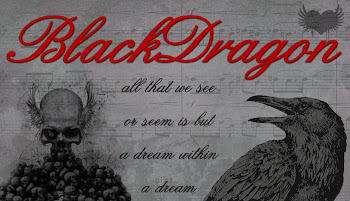 Black Dragon, you have done a stunning job on all your projects. Your death cab card has inspired me for a card for the SA challenge. It turned out awesome w/ all of your "inking." Love the swirls. And what a beautiful cross. 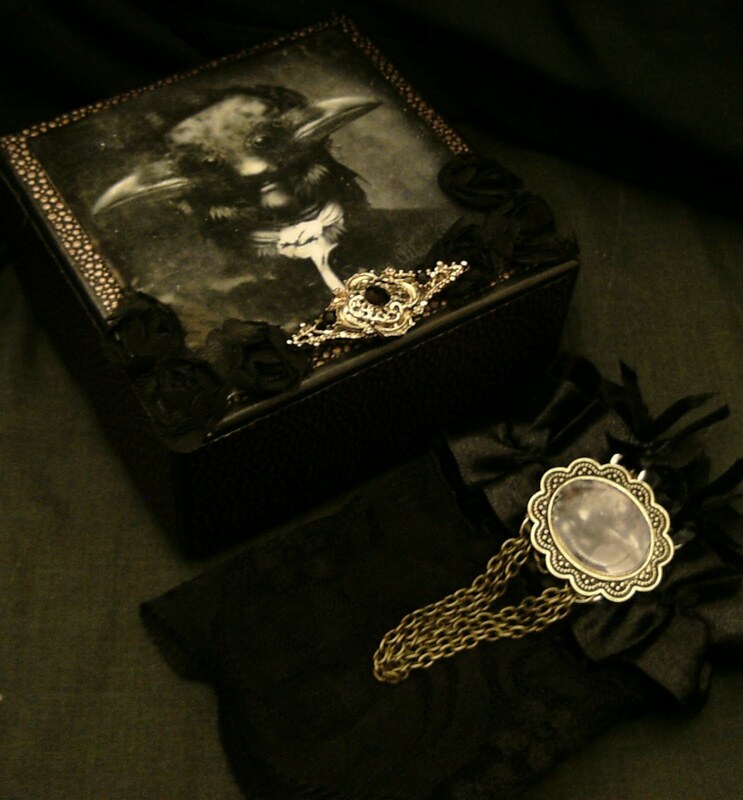 Terific creation w/ the box and satin and lace cuff so Goth looking! This is so special. I hope you come and play with us often in 2012, at Opus Gluei! Wow! You really did come back with a bang on these projects. :D Love the cuff too. Amazing internet digi you procured. Real craftsmanship and creativity in your both your projects. Nicely done. 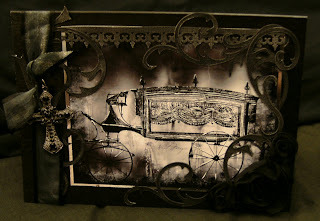 As usual another stunning gothic piece or two.. thanks for sharing on MIM..
these items are crazy cool...I could not dream anything up like that in a million years...I am always drawn in when I see an entry of yours on any challenges that I am entering...your cards are absolutely the complete opposite of anything I do and totally fabulous! thanks for joining in at the Opus Gluei this week! Love the creativity on both projects! Thanks for sharing with us at Pile It On! Love all your projects. 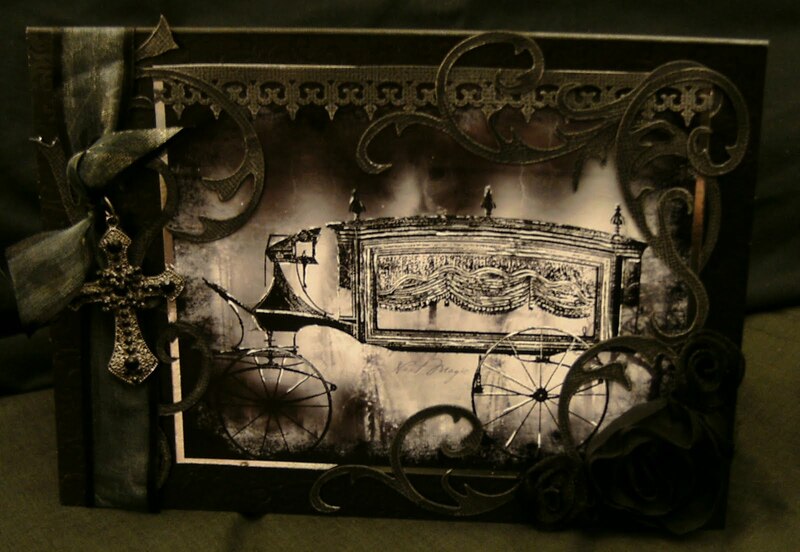 The death cab card is very atmospheric and darkly stunning. The box and cuff are brilliant creations. These are quite Goth and I think your altered box is very impressive and elegant - with the rich textures and embellishments. You always come up with an engrossing take on our themes and you challenge our thinking in a great way! Thank you for sharing with us at Opus Gluei! Awesome card! 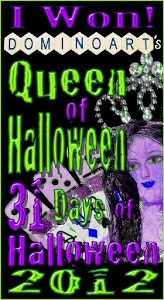 Love the image and great use of punches & diecuts! Thanks for sharing it with us at Paper Creations Ink and Happy New Year!